Benefits: Very competitive itch relief data, Alaway comes in a larger bottle size so usually I would recommend this to Zaditor. Of your OTC drops, these are your 2 best options! Benefits: This drops's FDA trial performance was great for patients even with "severe" itch, and results for itch relief are seen just a few minutes after drop insertion. There is a secondary benefit of action against post-nasal drip in some patients, so this eye drop can help your eye and nasal symptoms at the same time! It is a very comfortable drop to insert, with little to no stinging. Also it comes in a very large bottle size (up to 10 mL) so you are getting a lot of eye drop for your copay. Side Effects: 25% of patients experience a metallic after-taste after the drop is inserted. Benefits: Again, excellent itch relief within just a few minutes. Great with contact lens wearers that don't want to be bothered by putting drops in more than 1 x a day. Benefits: Typically really good insurance coverage since this drop has been on the market for a while. Good comfort with insertion. Side Effects: Runny nose/cold symptoms reported in 10%. Other draw backs: small bottle size (only 2.5 mL), and studies show Pataday and the older Patanol (which is 2 x a day dosed) perform almost equally in itch relief. What does this mean to you? If you have bad enough symptoms, you will likely be needing this drop 2 x a day instead. Approved for: No age minimum has been set, but the youngest study participant was 10. Age is up to doctor's discretion. Benefits: All of the antihistamine drops listed above just treat the symptoms, but Alrex (and steroids for that matter) actually treat the culprit -- inflammation. That means it works for swelling, redness, watering, puffy eyelids. You name it. A steroid is the only way to truly knock out an allergic response, and that is why allergists use them almost exclusively. 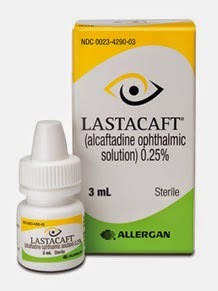 If you have a major ocular allergic condition like giant papillary conjunctivitis or vernal conjunctivitis, this is really the top of the line choice. Side Effects: If prescribed for longer than 10 days, your doctor should check your intraocular pressure. The incidence of significant (greater than 10 mm Hg) increase in IOP over a 28 day trial period with Alrex use was 2% of patients. Contraindicated in patients with a history of herpes simplex infections or concurrent fungal infections.